Order in next 14 hours and 18 minutes for despatch today. Springer Spaniel Bone China Mug. When you buy someone a mug as a gift you can always be sure it will be used. They are practical gifts which are nearly always appreciated. To make the mug more appropriate to the recipient it is a good idea to select one with a design or motif which is likely to either complement their decor or which illustrated something in which they have an interest. This range of mugs in bone china depicts; birds, domestic animals and wildlife and as such make great gifts for animal lovers, nature lovers and outdoor sportsmen. 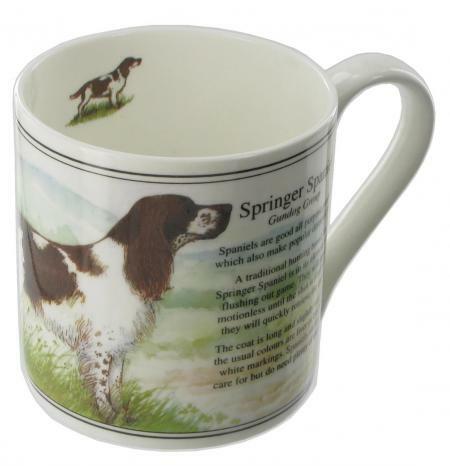 This particular mug bears an image of and description of the springer spaniel and would therefore make a good gift for s dog lover.